With the year coming to a close, I have decided to publish my performance reports for the four months that I have invested in the market for this year. This 4 months, my portfolio experiences an increase of 5%. This definitely beats inflation plus got me an additional 2 to 3% of returns in a year. 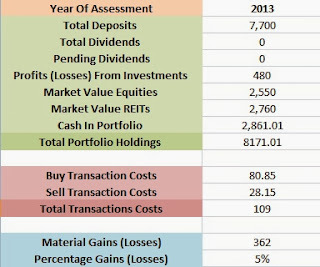 Just to clarify some items on the report, the Cash In Portfolio does not include my personal savings. This investment portfolio is entirely separate from my own savings account and I will never touch it easily. Profit (Losses) From Investments is an item that will only be non-zero if I made a sale of my shares. Total Portfolio Holdings is calculated from the preceding 3 rows: Market Value Equities, Market Value REITs and Cash In Portfolio. If you take a look at my cash component, you will notice that it is around 30+% of my entire portfolio. I was not able to convert the cash component into money generating REITs in time (due to a higher buying price which exceeds my personal margin of safety) and I felt a bit disappointed. The reason why I was unable to convert my cash component into stocks or REITs was because I sold some shares at a profit but there was delay in receiving my payment due to it being in the form of cheque. Therefore, the first thing I am going to do once I get back to Singapore will be to apply for GIRO for my brokerage account. My next year aim is to build my portfolio into $20,000, including reinvestment of dividends as well as increasing the deposits into the account through working multiple jobs. I have to brush up myself. I need to be more capable in order to succeed in the financial sector. I am willing to do whatever it takes to achieve my goal of someday being a hedge fund manager and everyday will be a challenge for the year 2014. Congrats to the excess gains beating both inflation and STI YTD returns. 30% cash can be deployed when you think price is at your level of safety, don't ever invest because you need to but rather when time is ripe. I learnt thru the hard way, patience is the key. You can always start managing your families monies to kick start your "fund manager" career when you are ready! Manage your own monies is definitely more exciting than others because you care! Hey there, thank you very much and Happy new year! True, I am going to wait. Too many times have I rushed into the market and missed out on some gains. As for the fund manager career, I think I will wait for my next year to realize even more gains before I start asking friends and families to invest with me. I want to be certain that I can really help people grow their wealth before asking them to trust me with it. I have a concept in my mind now and that is to charge no management fees and 20% of gains as an individual investor soon once next year proves to be a good year for my investment strategy.